This easy baked coconut shrimp recipe is great if you're looking to make something special to serve as an appetizer or finger food, but don't want to spend too long making it. Unlike most coconut shrimp recipes which are deep-fried, this one is easily baked up in the oven, which means less fat and calories. Excellent served with Thai sweet chili sauce (available in most supermarkets in the Asian section), or for an extratropical treat, serve them with my Easy Mango Dip (see below). ENJOY! Preheat oven to 425 F. Also, prepare a baking sheet by spraying it with non-stick cooking spray or covering it with parchment paper. Stir the coating mix ingredients together in a bowl. Set aside. In another smaller bowl, lightly beat 2 eggs. In a third bowl, place the shredded coconut. Holding the shrimp by their tails, dip first into the beaten egg, then in the panko mix to lightly coat, then dip back in the egg, and finally, roll in the coconut. Lay shrimp on their sides on your prepared baking sheet. Depending on the size and number of shrimp you're making, you may need to use one more egg. 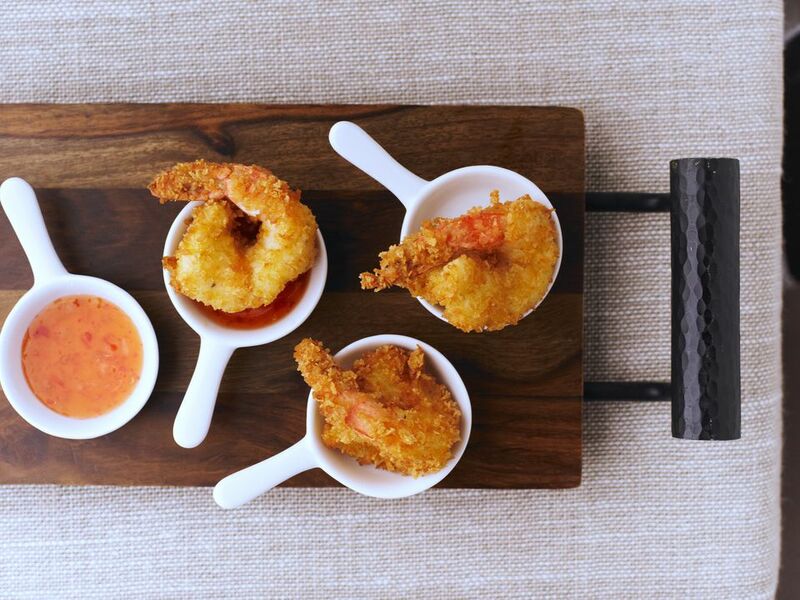 *Tip: Since they're going to be baked, avoid over-coating, or your shrimp will be flat on one side. Bake on the middle rack at 425 F for 15-20 minutes, or until coconut is lightly toasted (light golden-brown). Turn the shrimp halfway through baking. Serve with Thai sweet chili sauce (available at most supermarkets in the Asian section), or my Mango Coconut Dip. For Gluten-free Diets: Use plain or sesame-flavored rice crackers ground up into fine crumbs with a food processor or chopper (to make 1/2 cup). The results are very similar to Panko.